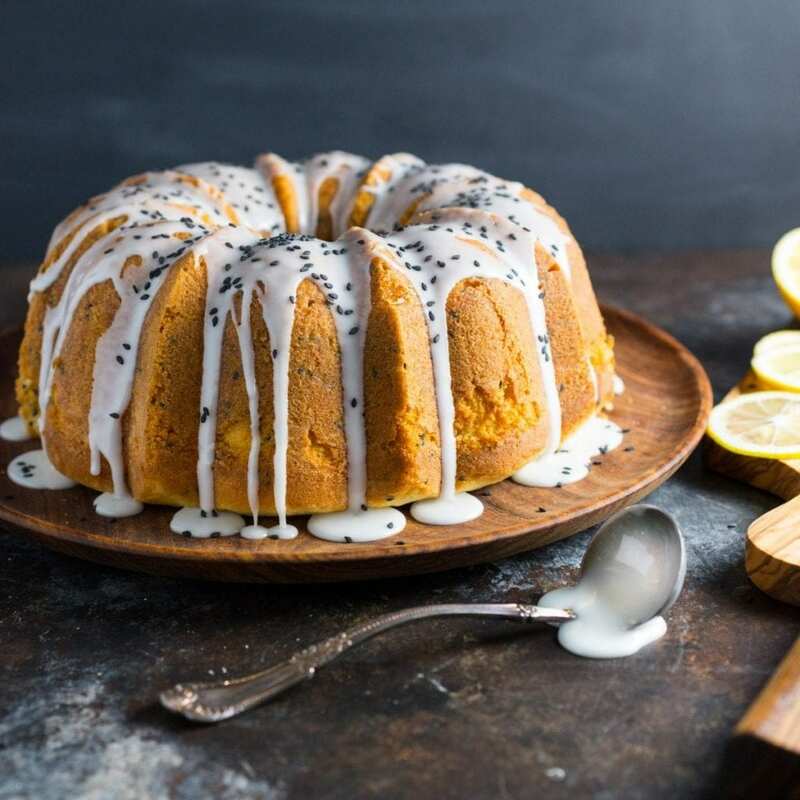 Lemon Sesame Seed Pound Cake! An unconventional combination which really works. Buttermilk keeps the cake tender, and lemon in the cake, syrup and glaze gives it a triple lemon tang. I discovered this afternoon why I love buttermilk. A quarter cup of seeds give the batter a little crunch. I thought this was hilarious in 1978 or whenever it was that I first heard it, and would repeat it verbatim to my parents and friends, even though I had no idea what buttermilk was, had never seen or tasted it, and my family, as far as I know, had never bought it or used it in a recipe. Of course, I was a kid, and everyone of a cooking age may well have been using the stuff constantly in the kitchen for all I know. In any case, I never encountered it until I moved to the US. A drizzle of lemon simple syrup boosts the citrus flavor and keeps the cake exceptionally moist. Since then, I’m a convert, and we use it all the time in baking – particularly in recipes risen with baking soda such as Ramp and Cheddar Biscuits and Key Lime Cupcakes, as well as as a batter ingredient in this Ultimate Fried Chicken Sandwich. We almost exclusively use Kate’s Real Buttermilk which is an old-fashioned cultured hormone-free milk, it’s fantastic stuff, and they’re not even sending us free buttermilk for saying so (although, Kate, if you’re reading, we love you, call us). If you can’t find good buttermilk, you can make it yourself: just put a tablespoon of lemon juice or white vinegar in a measuring cup and add enough milk to make it equal 1 cup. Let it sit for 5-10 minutes while you prep the rest of the recipe. You can find this method and several other methods for making buttermilk at Olivia Rose’s recipe blog My King Cook. Look at this handmade Japanese knife! Sesame seeds take the place of poppy seeds in this cake, giving it more of a crunch. We needed to bring a dessert to friends we were visiting last weekend: something we could make a day ahead and that would travel well. We knew that a pound cake would work very well, and we happened to have a fridge drawer filled with lemons left over from a few days of lemon curd making. 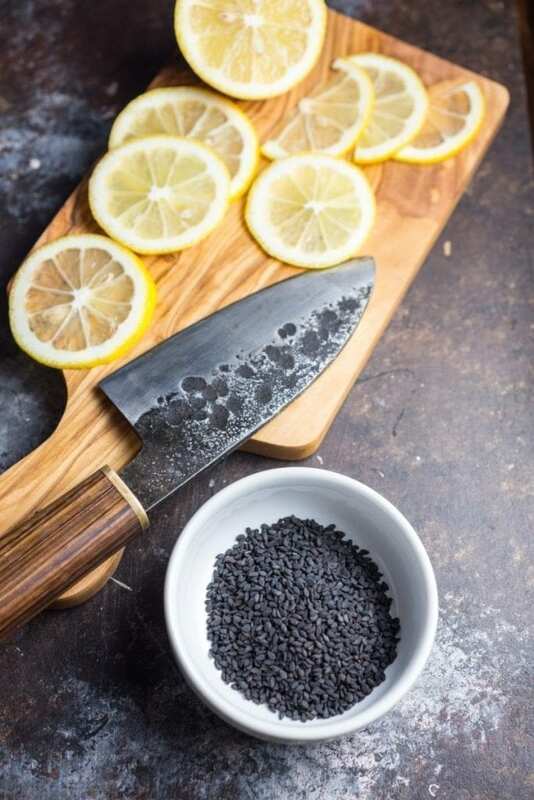 Lemon and poppyseed is a classic combination, but we had just bought a large bag of black sesame seeds from our local Asian market, and Emily had the inspired idea to combine them. So lemon sesame seed pound cake it is. The final glaze adds another layer of lemony flavor. The recipe has three components, but it’s really straightforward and you don’t need to sweat it. The usual cake-making approaches will apply: don’t over-mix the batter once the dry and wet ingredients are combined, and don’t over-bake it (we suggest 75m but you can check after an hour). Like with all Bundt cakes, butter and flour the tin very well if you’d like to get the cake out with a minimum of stress. Pound cake will actually have a more elegant texture and more complex taste after resting for a day, so make it the day before you plan to serve up. You’ll also notice that this recipe calls for both butter and vegetable shortening (our version is adapted from the famous Cruze Farm recipe via the New York Times). You can use all butter if you like but the shortening results in a tender, more lightly-textured cake. Shortening contains no water and has a higher melting point than butter, which allows the eggs and flour time to puff up. Of course, it also has no flavor which is why you want to use at least half butter. The cake is tender and light, with good lemony flavor. I’m glad to have found another use for buttermilk! I still don’t know why you would ever want to drink it, though. Just please do wash out the glass afterwards. Do it for Bob Shelley. Preheat the oven to 300 degrees. Butter and flour a bundt pan, tapping out excess flour. In the bowl of a standing mixer fitted with a paddle attachment, cream the butter and shortening, stopping to scrape down the sides. Slowly drizzle in the sugar; beat the mixture well. Beat in the eggs one at a time, adding the next when the last has been incorporated. Mix in the vanilla. On low speed, mix in a third of the flour mixture until just combined. Add a third of the buttermilk, mixing until just combined. Repeat with the remaining flour and buttermilk. Add the lemon juice, zest, and sesame seeds and mix just enough to combine. Pour the batter into the prepared pan. Bake until a cake tester inserted comes out clean, about 75 minutes. The top of the cake will be lightly browned, and the sides will shrink slightly from the pan. While cake is baking, make the simple syrup. Combine the granulated sugar and lemon juice in a small saucepan over medium heat. Stirring constantly, cook until the sugar has dissolved. Remove from heat and set aside. Invert the slightly cooled bundt cake onto a wire rack set over a large plate or serving dish. Slowly spoon the syrup evenly all over the top of the cake, allowing it to soak in as you go. Allow cake to fully cool before glazing and serving. Make the glaze: Whisk the confectioners' sugar and lemon juice together in a small bowl. Drizzle over cake. Sprinkle with sesame seeds. Slice and serve. Make ahead tip: Prepare cake and syrup through step 6. Cover the cake tightly and refrigerate for up to 2 days or freeze up to 2 months. The flavor will be amazing after this time! Bring to room temperature and continue with step 7. Wow! Great cake! Fabulous knife!!! Thank you! I can’t believe how gorgeous the knife is. It’s really amazing. Oh wow this is soon incredibly beautiful!! Plus lemon and sesame are my absolute favorite flavors so I will definitely be trying this out soon!! It looks like a blooming flower cake 🙂 i can’t stand its attraction. It’s too attractive. I have made this cake a bunch of times, it is so hecking good. I made a version with blueberries instead of the seeds, and that was amazing too.